AnyIndo - A few months ago Lenovo issued an update to version 5.0.2 android Lollipop for Lenovo A6000, this upgrade would bring some changes such as UI thats has little change and some security patches but in terms of performance and stability Kitkat version still feels superior, so that many users Lenovo A6000 figure out a way to downgrade to Kitkat version. All people have the reason to upgrade or stay with old system operations. I represent my team, I still do not update my device to KitKat or Lollipop because Jellybean is still good enough for me and I think it has excellent process to execute menu or opening anything on my android device. To downgrade or back to Kitkat does not need to use a PC, because the process is through your Lenovo. In this tutorial we will guide you to downgrade by using stock or custom recovery such as TWRP recovery. Download the Firmware file and specify with your android device, if you use Lenovo A6000 you can download KitKat Lenovo A6000, and if you use Lenovo A6000+ you can download KitKat A6000+. Go to the recovery menu by pressing the Volume Up, Volume Down and Power simultaneously hold until the Lenovo logo appears and then release. Usually booting process takes about 10 minutes or more, just wait until your device is on to back to the homescreen. If this is successful, your Lenovo 6000 or Lenovo A6000+. For those who flashing through TWRP we highly recommend after a successful downgrad to immediately install TWRP Kitkat. 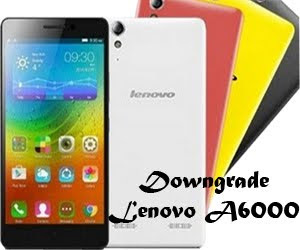 That's all about this article and we hope that this article is useful for anyone who needs this article to downgrade Lenovo A6000 or Lenovo A6000+. Belum ada tanggapan untuk "Downgrade Lollipop To KitKat Lenovo A6000 Without PC"